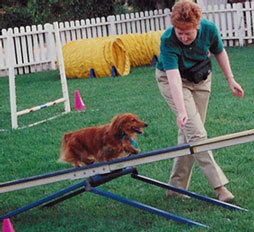 Brandy and Remy started agility training in July 2001 at Jump Start Dog Sports in Yorba Linda. 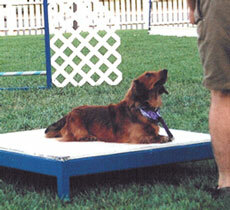 Brandy and Remy jump at the 8" height in AKC agility. 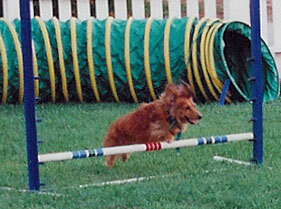 Since Brandy is 7 3/8" high at the withers, she struggles to get over an 8" jump (Note: The AKC introduced a 4" Preferred class in September 2001, and Brandy now jumps at 4".) Brandy also likes looking for dropped treats on the course. 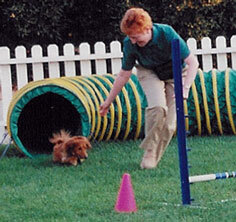 Click here for pictures of Remy and Brandy competing in AKC agility trials. 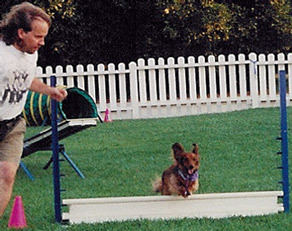 John brings Remy over the panel jump. Remy does a nice down-stay on the table.